Gary Harris is something of a nomad. A carpenter for 45 years and an all-round handyman, he’s forged a reputation as a tradie who will travel extreme distances to get a job done. To Gary, few areas are too remote, and few jobs too small or unusual for him to consider. One of his oddest jobs, Gary recounted, was fixing a garage door after a customer drove into it. “When I got there, the door was mangled, and the owner couldn’t get any of their vehicles out of the garage,” recalled Gary. While doors are his specialty, he also does plastering, tile repair, minor plumbing and general carpentry work. In September 2016 Gary decided to start Travelling Tradie—the Door Specialist, his own venture, and embrace life on the road. “I am my own boss and I have all the freedom I want, going anywhere I want. It’s the life I’ve always wanted,” Gary said. 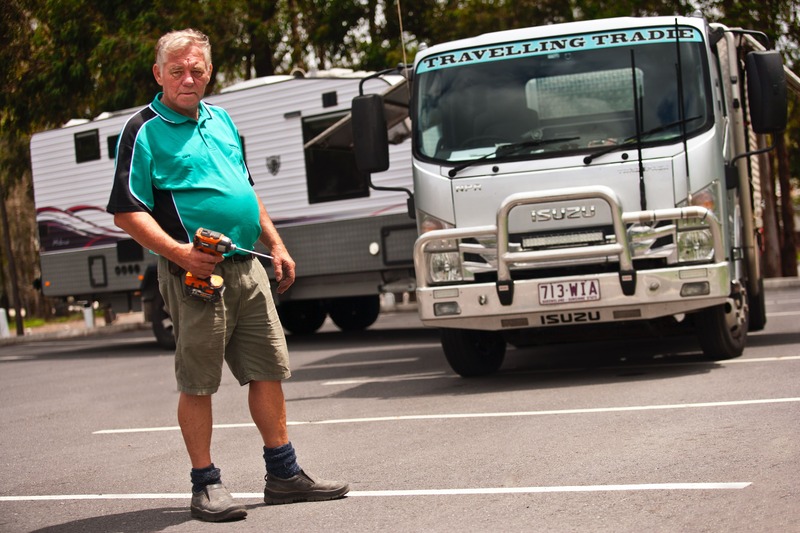 With his Isuzu NPR 45-155 Tradepack, Gary not only takes his skills and his tools on the road, but also uses his work truck to tow his caravan as he moves across the amazing and varied expanses of Australia with his beloved travel companions, a Jack Russell Terrier named Bella and a Cockatiel named Jacko. The decision to buy an Isuzu wasn’t an accident—but it was the result of one. “Two years ago, I had a head-on collision in my ute.” Gary said. The situation was a clarifying one for Gary, who decided he needed something that had the power to tow as well as excellent safety features. “This was a pretty serious accident, and it reminded me that weight and loading was a serious issue. My old ute just wouldn’t have been able to handle a 3.5-tonne caravan. 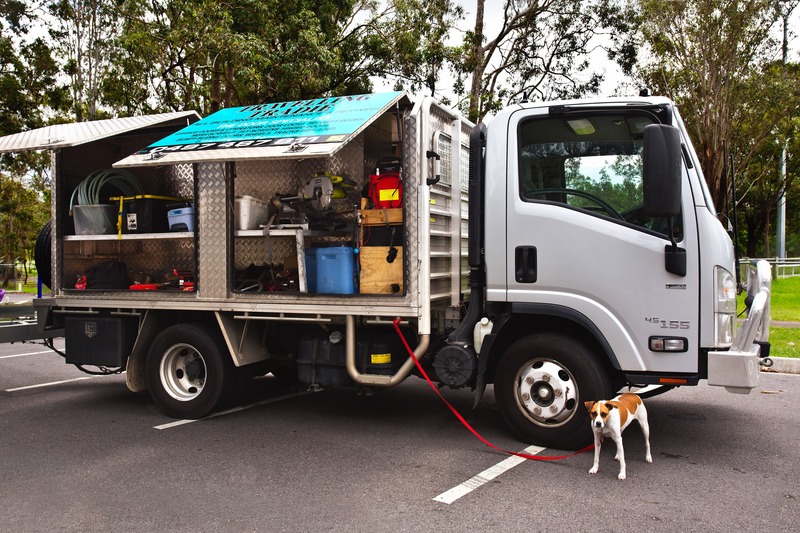 Our Travelling Tradie has put the NPR through its paces in terms of durability, power and drivability too. “It’s been everywhere; I’ve driven it for long stretches. I’ve given it a good trial way out west as well, driving it along developing roads. You don’t see many Isuzus broken down on the side of the road either,” declares Gary. With more than 60 dealerships across the country, Gary’s in safe hands when it comes to maintenance and aftersales support too. “With the road hours I’m putting in, regular servicing is pretty important. If I need to service it, there are service centres everywhere, which makes life on the road a little easier,” he said. Needless to say, the NPR has more than enough power and durability for Gary’s work and towing purposes, but it’s more than just a reliable workhorse. “It’s so bloody good to drive—far easier to drive than the other trucks I’ve had in the past. I find that European trucks date too quickly. Parts and servicing is an issue with most brands here in Australia too. Boasting an excellent turning circle (better than many utilities currently on the market), Gary is blessed with fewer access issues, is able to park is most car allocated parking spots and is able to negotiate camping and rest stops with less stress. Gary is eager to continue many more journeys across Australia in his Isuzu with his feathered and furry companions keeping him company. “My Isuzu is everything I had imagined and more. The cab’s very comfortable, Bella loves it too,” Gary said.